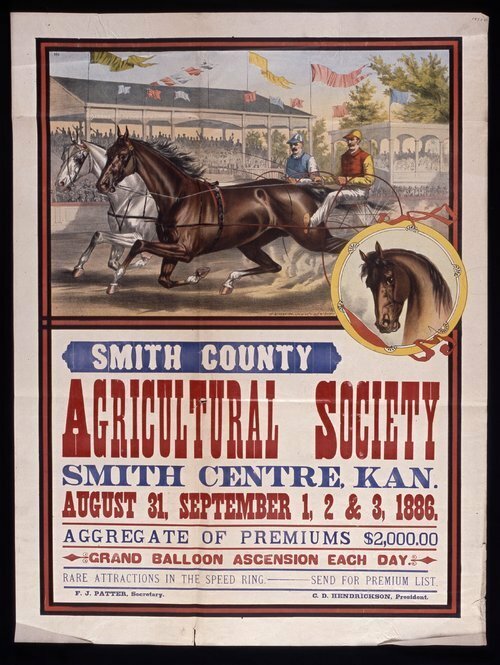 This poster announces a fair at Smith Centre, Kansas, sponsored by the Smith County Agricultural Society. Highlights include $2,000 in premiums, races, and a grand balloon ascension each day. The poster includes a color illustration of a sulky race with horses and riders. Fair officers are C. D. Hendrickson, president, and F. J. Patter, secretary. NOTE: Patter is listed as Pattee on the other 1886 Smith County fair poster.